Better taste than carrageenan-free, store-bought options??? I could write an entire post on that last bullet point, but we’ll try the brief version. Carrageenan is a “natural” additive, derived from a type of seaweed, used in food as a thickener and/or emulsifier to improve flavor and mouth feel. It’s found in many processed foods, not just soy milk. WebMD says carrageenan is, “safe for most people in food amounts,” but the Center for Science in the Public Interest (CSPI) gives carrageenan a “Caution” rating, stating “May pose a risk and needs to be better tested. Try to avoid.” (For a full report on carrageenan and human health, with links to peer-reviewed research, see this publication from the Cornucopia Institute.) There is evidence that it may be especially prudent for individuals with Inflammatory Bowel Syndrome or other GI disorders to avoid consuming carrageenan. I am not affected by any GI disorders, but the CSPI’s “Caution” rating was enough to make me want to investigate alternatives, and store-bought soy milk is the main source of carrageenan in my diet. When it comes down to it, I don’t consume all that much soy milk. I’m not drinking three 8-ounce glasses per day. In fact, I rarely drink soy milk at all. I consume 1/3 to 1/2 cup a day in my oatmeal. Some days, that’s it. Other days, I have a bit more, either in hot chocolate, with cold cereal, or, very rarely as something I sip with a cookie. A bit more slips into my diet some days via our homemade pancakes and waffles, but I think it’s safe to say that I average less than one cup of soy milk a day, total. My other concern, of course, is Gabriel. I would estimate his soy milk consumption at about 1/2 cup most days. While he likely consumes a bit less than me, his body is smaller than mine, and perhaps more vulnerable to questionable ingredients. As far as I know, Gabriel does not suffer from any GI disorders — he doesn’t complain of stomach pain, and his bowel movements are regular. A few years ago, I decided it was important to eat organic soy as much as possible. This decision was not necessarily for health reasons, but rather to avoid GMO soybeans (avoiding the GMOs is also not necessarily for health reasons; for me, it’s about avoiding big agribusiness that threatens small-scale, local growers and food systems). For carrageenan-free options, I tried Trader Joe’s Unsweetened Organic and WestSoy organic unsweetened. Both of these come in aseptic quart cartons and do not require refrigeration until after opening. Ingredients are simply water and organic soybeans. To me, the carrageenan-free options were missing something in the taste department. They were fine for my oatmeal and for cooking (e.g., making pancakes), and okay for hot chocolate, but not particularly appealing on cold cereal or for sipping. Part of my motivation for making my own was to see if I could make something that tasted good, without carrageenan and other “natural flavor” additives. The other motivation was the waste factor: the store-bought options without carrageenan only come in quarts (vs. the half-gallons size of Silk and similar products). Smaller quantities mean a higher packaging to product ratio, so by switching to the [quart-sized] carrageenan-free option, I was going to be generating proportionally more trash. Uck. Plus, what exactly is in the lining of those aseptic containers? Nothing beats a good, old-fashioned glass jar! When I started questioning carrageenan, my friend again offered to let me borrow her soy milk maker. The timing was particularly good, because her family had taken a break from using it. It’s been great getting to try the machine, and the resulting product, before committing to buying an appliance just for making soy milk. I’ve been experimenting with it for three weeks now. I’ve tried straight-up soy milk, plus a number of variations: adding coconut cream, a peanut soy blend, a cashew soy blend, and even a version that used some black beans. Tomorrow, I’ll report back on the results! 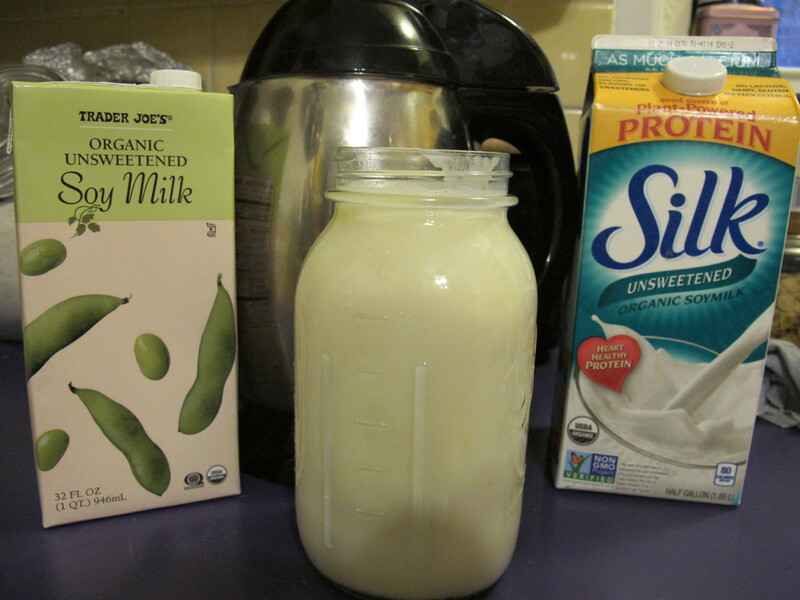 This entry was posted in Food, Green Ideas and tagged DIY, soy milk. Bookmark the permalink.